Let’s look at the basics of starting and growing the plants most often cultivated by the homeowner/gardener—grass. That’s right—millions of tiny little plants whose health and vigor can mean the difference between a beautiful lawn that enhances the outside appearance of your home or makes it look completely uninviting. What do we need in order to get started? Well, assuming we’re not in such an all-out hurry to get a perfect lawn instantly (which requires installing sod), we will do what any good gardener would do—we will grow our own grass plants from seeds! For purposes of today’s discussion on seeding a lawn, please note that our information is based on growing a lawn in the mid-southern United States (Tennessee). In this part of the country, most homeowners plant cool season grasses—most commonly Kentucky 31 Fescue. Some of the hybrid fescues are also planted in this area. The hybrids produce a denser plant with narrower individual grass blades, making a smoother more lush appearing lawn. In addition, the hybrids are usually more drought and disease resistant. Another difference between hybrid fescue seed and the Kentucky 31 is the initial cost of the seed, usually about a dollar for each pound of Kentucky 31 and about twice that price for each pound of the hybrid seeds. After we decide which kind of seeds we will sow, the next factor to consider is “when to plant.” Since we’ve already said the fescues are cool-season grasses, we need the seed on the ground just as the summer heat is dying away and the cool of fall is upon us in order to attain maximum germination and a good start before the real cold of winter arrives. Also—and this is an important consideration when seeding cool season grasses—if we plant in the FALL, we’ll actually have TWO cool seasons of ideal growing conditions (fall and spring) before the summer heat sets in and slows the growth of our newly seeded lawn. Next, how do we get the seed on/in the ground? The quickest way—and the way that is the closest imitation of how its done in Nature—is to sow the seed onto the top of the soil with a broadcast spreader. This works especially well if you already have a basic (though somewhat thin) stand of grass, because the existing grass plants will help hold the seeds in place and act almost as a mulch to keep them from washing away in a heavy rain. I’ve used this broadcast method many times, and most always have had good results. If there are a few small bare areas, you can loosen the surface of the soil with a garden rake before adding seed. For lawns that are spotty and need more extensive disturbance of the soil in order for the grass seeds to get better contact with the soil, it may be desirable to use an aerator or a slit-seeder in your lawn establishment project. 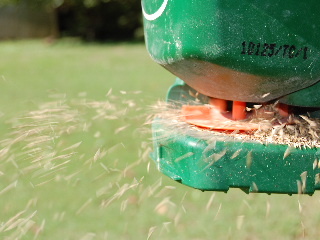 For useful information on this, please read Aerator Vs. Slit Seeder: What's Best For Your Lawn? Apply the seed at the rate of about 50 pounds per 10,000 square feet of surface lawn area. (An acre is about 44,000 square feet). Use a good starter fertilizer with an analysis high in phosphorous and potassium (and not so much nitrogen) in order to encourage deep healthy root development rather than just a lot of top growth. Numbers On The Fertilizer Bag: What Do They Mean? If there are a lot of bare soil areas after you seed, apply a mulch of wheat straw to help hold the seeds in place until they germinate and can secure a strong foothold in the soil. Temperatures in the range of the 60s (degrees Fahrenheit) are ideal for germination and growth of the fescue seeds. 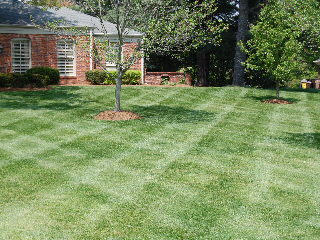 Several weeks of such conditions can secure a good beginning for your lawn. The other factor needed for lawn growing success is, of course, moisture. You may want to break out the lawn sprinklers if rainfall is scarce during the time of lawn establishment. However, there’s just no substitute for a good ol’ slow and steady chlorine-free irrigation, compliments of Mother Nature, to make your grass seeds rejoice and sing. As your fescue lawn establishes, mow it at a height of 3 to 3½ inches and apply periodic feedings of lawn fertilizer. Use your hose-end sprayer to eliminate weeds from your established lawn after it has been mowed several times.